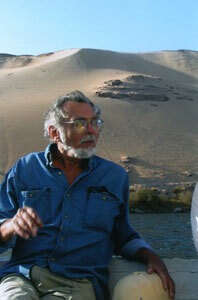 JOHN ANTHONY WEST, writer and rogue Egyptologist, has been studying and writing about ancient Egypt for over three decades. He is the foremost exponent of the 'Symbolist' school of Egyptology--which sees (and demonstrates) an ancient sacred science where modern academics see mainly superstition. West's work redating the Great Sphinx of Giza via geology, (proving that it must be at least 10,000 years old or older) was the subject of a 1993 NBC Special, The Mystery of the Sphinx, hosted by Charlton Heston. Viewed by 30,000,000 people, this was one of the most successful documentaries ever shown, and it has escalated into a heated international scholarly controversy. West won an Emmy in 1993 for Best Research for his work on the video and the show itself was one of four nominated for Best Documentary Program. The BBC subsequently produced its own version of the show for its prestigious and popular science series, Timewatch. Retitled Age of the Sphinx, the show recorded the second highest ratings of any Timewatch episode and generated still further controversy in the English press. West's non-fiction books include Serpent in the Sky: The High Wisdom of Ancient Egypt (a detailed examination of the symbolist interpretation of Egypt), The Traveler's Key to Ancient Egypt, and The Case for Astrology. He has also written a book of short stories, a novel, plays, and film scripts. His essays and criticism have appeared in The New York Times, Conde Nast's Traveler, and many other general interest and specialized publications in America and abroad.